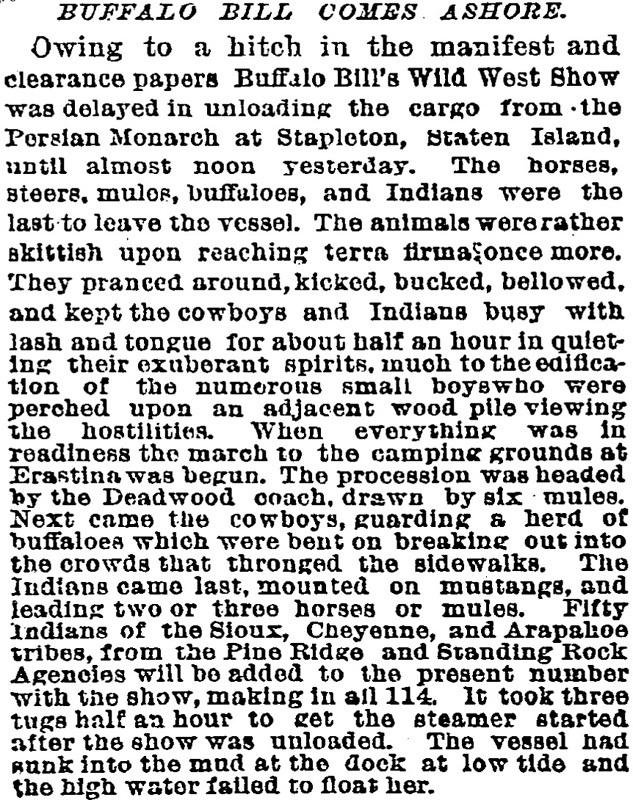 Owing to a hitch in the manifest and clearance papers Buffalo Bill's Wild West Show was delayed in unloading the cargo from the Persian Monarch  at Stapleton, Staten Island, until almost noon yesterday. 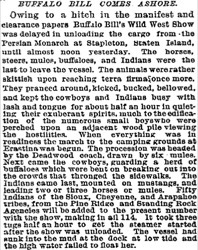 The horses, steers, mules, buffaloes, and Indians were the last to leave the vessel. The animals were rather skittish upon reaching terra firma once more. They pranced around, kicked, bucked, bellowed, and kept the cowboys and Indians busy with lash and tongue for about half an hour in quieting their exuberant spirits, much to the edification of the numerous small boys who were perched upon an adjacent wood pile viewing the hostilities. When everything was in readiness the march to the camping grounds at Erastina was begun. The procession was headed by the Deadwood coach, drawn by six mules. Next came the cowboys, guarding a herd of buffaloes which were bent on breaking out into the crowds that thronged the sidewalks. The Indians came last, mounted on mustangs, and leading two or three horses or mules. Fifty Indians of the Sioux, Cheyenne, and Arapahoe tribes, from the Pine Ridge and Standing Rock Agenices will be added to the present number with the show, making in all 114. It took three tugs half an hour to get the steamer started after the show was unloaded. The vessel had sunk into the mud at the dock at low tide and the high water failed to float her.